Heat and moisture is the worst enemy of roof spaces. Solar roof fan is the answer. Solar roof ventilation makes a significant difference to the comfort level of a building. Many often neglect this area of the house but it very important to regulate the temperature to protect the building from damage in the long run. A wide range of products is available in the market. You would get full assistance from solarmatic experienced professionals in taking the right decision. During summers, roof gets heated due to scorching heat from the sun and it puts the load on air conditioners installed inside the houses to keep the inside temperature low. The hot air from the roof does not find any vent to escape and hot air starts accumulating in the attic. Solar roof fan comes to rescue in this situation and it actively circulates the hot air and allows the entry of cooler air, thus reducing the indoor temperature substantially. In this process, the surface temperature gets low and hence it prevents the hot air from entering the house. This results in a cooler environment without putting excessive load on the air conditioner and you can save on your electricity bill also. During Winters, snow gets accumulated under the eaves which prove detrimental and affects the condensation process which can render the insulation ineffective and cause the wood to rot. A proper ventilation is a way to a healthier home. If you look at it from the broader perspective, Solar roof ventilation is adding value to your property. It plays a major role in saving the roof from heat and moisture. Excessive heat causes shingle distortion and moisture deposits onto the wooden structures and in the insulation can result in Mold formation, Rot, Compression of the insulation. A solar fan is the most efficient way of ventilation compared to the traditional power fans. Installed in under 1 hour by a Solatube Certified Installation Consultant. Roof type – Airflow is paramount. If your home has a basic tiled roof, then airflow is usually adequate for the exchange of outside air. If the tiled roof contains sarking (a layer of insulation underneath the tiles) or a COLORBOND® steel roof is installed, then airflow will be restricted leading to a build-up of hot air. Insulation – This is a great way to shield your home from hot temperatures in your roof space. While insulation will minimise roof cavity heat transfer and therefore reducing the impact in your home, roof ventilation will create healthier roof environment prolonging the life of your insulation. Gable or Eave Vents – These are designed to increase cross airflow in your roof space and reduce hot air being trapped. A mechanical fan can assist in extracting that air. As you have come to know about the benefits of proper roof ventilation, the next question that comes to mind is how you can implement this as quickly as possible with little cost and maximum performance. Weigh the pros and cons of a solar star to other products available in the market, you will get to know it is the best option available. 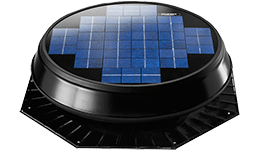 Nowadays, Solar Roof fans are gaining popularity over electric fans because they are pocket-friendly in the long run and the icing on the cake is you will get rid of the loud irritating noise of electric fans. Solar roof fans do their job silently helping you to have your peace of mind. Solar fans are environment-friendly as they work on sunlight which is not harmful to the environment. You can see a major dip in the energy consumption because roof fans work round the clock to maintain a healthy atmosphere. It even works well on windy days. Solar Star comes with 10 years of warranty and it does not have any operational cost. Solar fans come with various accessories to meet all your custom ventilation needs. Each home has a different solution and our services are available to tackle each situation individually. A classic roof mount model for a wide range of roof ventilation needs. For example low sloped roofs with a smaller area. This robust roof mount system is designed to accommodate even the most expansive roof spaces. For steeply sloped roofs with a smaller area. Contact SOLARMATIC for any queries on how the Solar Star will benefit your home. Get the facts by reading our most frequently asked questions about Solar Star Roof Vent. Does the Solar roof fan have an on-off switch or thermostat? Roof spaces by design are meant to be ventilated year-round. The Solar Star does have a thermostat add-on option, however. Should my Solar roof fan run during the winter? There are many benefits to ventilating your roof space during winter. The Solar Star unit, being solar powered, operates on daylight, but a thermostat option is available. During the winter, proper ventilation helps prevent condensation from forming within the roof space, which would cause significant heat loss from the home if the roof space insulation gets wet. A cool, dry roof space is the best solution for keeping the heat in the house during the winter. Does the Solar roof fan run at night? There are no batteries on the Solar Star, the unit only runs when daylight is available on the solar panel. Is the Solar roof fan quiet? 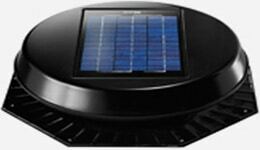 The Solar roof fan is whisper quiet and would likely not be audible from within the house or in the yard. What if the roof location doesn’t have all-day sun exposure? The Solar roof fan runs best when the solar panel is in direct sunlight. The unit will run at a reduced speed in the shade (provided sky is bright) but if one has heavy shading for a good portion of the day an “Add-on Solar Panel” for the Solar Star is a great idea. An extra panel can be placed up to 15′ (4.5m) away (possibly on the opposite side of the roof) from the main roof unit to provide better all day performance.